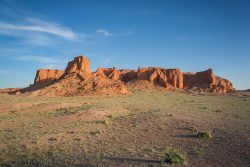 Gobi Desert is a place where a man learned to live in harmony with austere nature. We decided to check it by ourselves. 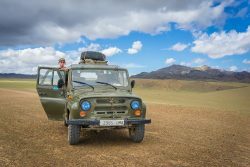 Together with charming Mr. Dambee, a person who spent basically entire life there, we decided to pack few gallons of water and drive half thousand of kilometers with an old Soviet UAZ. We experienced breathtaking landscapes like Singing Dunes, Flaming Cliffs and Yolyn Am. We were drinking hot tea in sweltering heat, got stuck in the desert with broken axle, assisted in goat milking and shaman rites in nomad’s settlement. 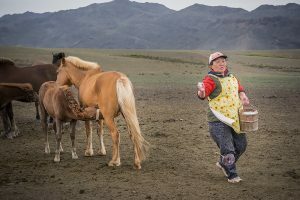 Mongolia is a huge country with diverse nature and interesting history: traces of Mongolian empire which impact can be seen even today in Europe, interesting and rich culture as well as the fact that the country was influenced by two powerful countries – former Soviet Union and China – make Mongolia an interesting destination. We would like to share with you our stories during the evening. No worries, we will also give some practical hints, inspire and entertain you with many crazy stories and adventures we experienced during this exciting journey.